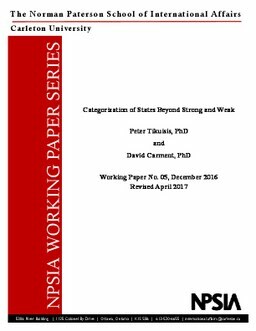 The discourse on poor state performers has suffered from widely varying definitions on what distinguishes certain weak states from others. Indices that rank states from strong to weak conceal important distinctions that can adversely affect intervention policy. This deficiency is addressed by grouping states according to their performance on three dimensions of stateness: authority, legitimacy, and capacity. The resultant categorization identifies brittle states that are susceptible to regime change, impoverished states often considered as aid darlings, and fragile states that experience disproportionately high levels of violent internal conflict. It also provides a quantifiable means to analyze transitions from one state type to another for more insightful intervention policy. Tikuisis, Peter, & Carment, D. (2017, April 6). Categorization of States Beyond Strong and Weak. Country Indicators for Foreign Policy (CIFP). Norman Paterson School of International Affairs.